"U.S. General Officers Pistols: A Collectors Guide" has finally arrived after a lengthy gestation. It covers all USGI pistols and revolvers issued to US General Officers from the inception of the program in WW2 to now. While some of the GO guns are familiar to martial arms collectors (the Colt Pocket Automatics in .32 and .380 ACP) others are not (the S&W Model 39 issued to USAF Generals). The co-authors, Kevin Williams and Dr. John W. Brunner, approach the subject from a deep knowledge base. Williams is an arms researcher and prolific author who has published articles in Man At Arms, The Rampant Colt, and the S&WCA Journal. Brunner is an OSS veteran and the author of OSS Weapons II, The Colt Pocket Hammerless Automatic Pistols II, and OSS Special Operations in China, among others. Earlier books, such as 1989's "The Colt General Officers Pistols" by Horace Greeley IV, have provided a foundation for collectors of GO pistols. 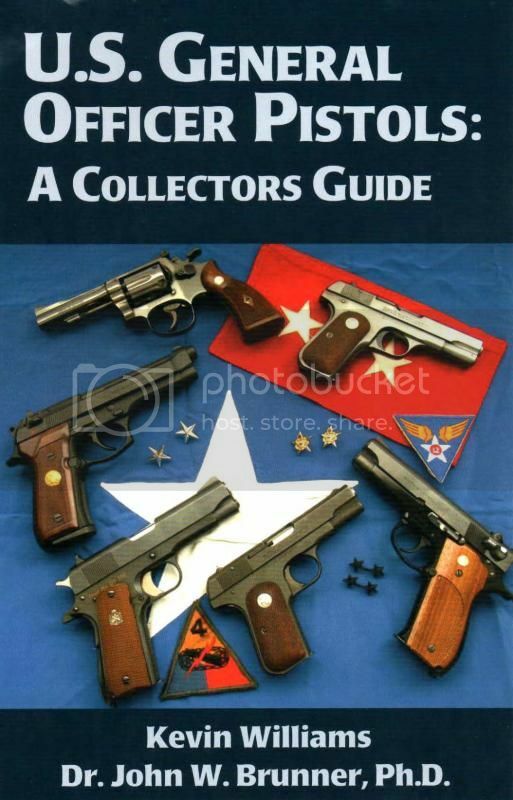 "U.S. General Officers Pistols: A Collectors Guide" extends that body of knowledge and provides new, never before published information on many topics including the Beretta M9 GO pistols and the interesting and varied GO pistol accoutrements. Providing useful context are the numerous period photos of GO pistols in use. Of particular value to collectors is the listing of USAF GO pistols by serial number and another list of M1911A1 .45 pistols issued to GOs during that period of time when the purpose-built GO pistols were out of stock. Of great utility will be the list of Colt Pocket Autos that are tabulated by both serial number and by the name of the GO to whom they were issued. At 254 pages the Guide covers the waterfront on these pistols so well that it is hard to imagine a better book on the subject ever being attempted. From Phillips Publications it is priced at $79.95. Highly recommended. Kevin Williams has copies available at his website http://www.usgipistols.com/ .